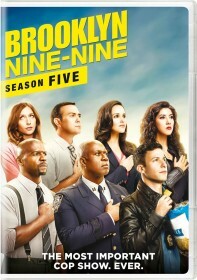 Enjoy all twenty-two episodes of Brooklyn Nine-Nine's fifth season all over again with this three-disc DVD box-set complete with previously unseen deleted scenes. Enjoy the fourth season of Brooklyn Nine-Nine all over again with this three-disc DVD box-set. Enjoy the third season of Brooklyn Nine-Nine all over again on DVD with this three-disc box-set containing all 23 episodes from the 2015/16 season. Pre-order the second season of Brooklyn Nine-Nine on DVD. Enjoy all twenty-two episodes of Brooklyn Nine-Nine again on DVD with this three-disc box-set.